In properly caring for and storing your costumes you won't only prolong their life, but you can also keep them looking just as spooky as when you first bought them. Here's a roundup of "Do's & Don'ts" in extending the life of costumes for any good Halloween collector. Please be aware that any altered costume is ineligible for a return. Learn more about our return policy. 1. Perhaps you have a costume that is too big. In this scenario, safety pins are a quick and easy fix to decreasing the size of your costume, as is adding strips of adhesive velcro. Having it tailored or sewing it yourself are also other options to keep in mind. 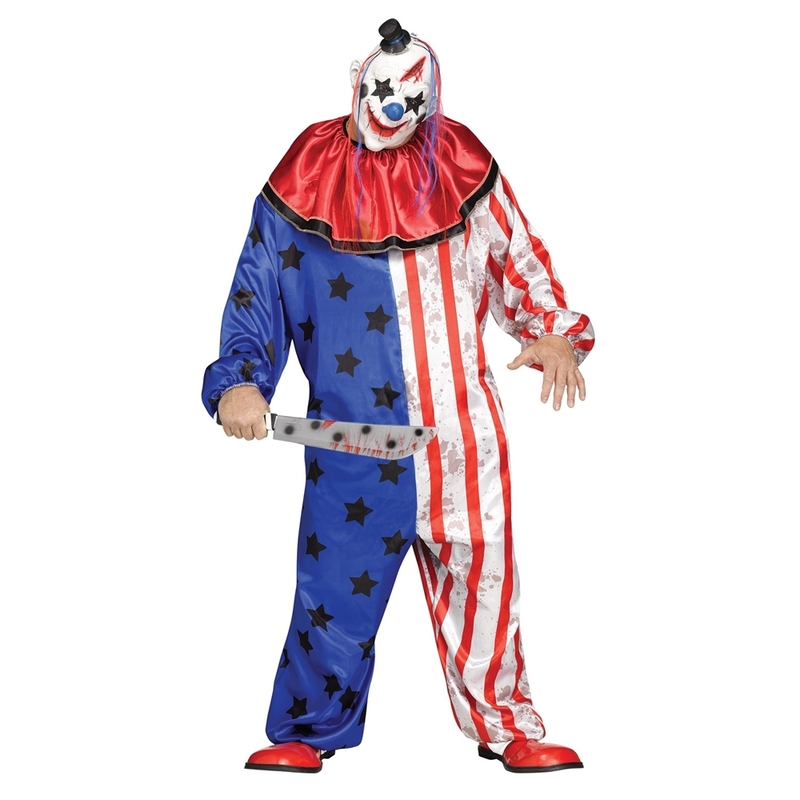 Though the Stars & Striped Evil Clown Adult Mens Plus Size Costume is meant to be loose-fitting, some might desire a tighter fit. By following these tips you can alter your costumes without spending a whole lot of money. 2. If you're experiencing an issue with the length of your costume and not its width, know that most of our costumes can be cut without fear of the fabric falling apart. If you're creating a hemline you can use a no-sew product that can be ironed on like hem tape. Double-stick tape is an alternative solution. Even though some of our costumes have been designed with a certain look in mind, some of us may want to make adjustments here and there due to length issues or personal preferences. The Egyptian Nile Queen Adult Womens Plus Size Costume is an elegant piece that may seem lengthy to some. But with a quick snip-snip with scissors along with some no-sew hem tape you'd be able to make the necessary adjustments in pulling off a unique version of this Nile queen. Enhancing your costume with extras will allow you to come up with costume combinations that are unique and personal. 1. Does your dress lack volume? Add petticoats! The Red Shimmer Organza Petticoat is a great way to puff up your dress if you're costume is a period piece or you're looking for a different way to present your costume. 2. Maybe your costume's sleeves are too wrinkly? Puff them up! This can be done by stuffing them with tissue paper, extra fabric, paper towels, or even poly-fil. 3. If you're wearing a skirt that is a little too short for your liking you can always add a pair of non-transparent leggings or tights which will resolve this issue. Playing around with different colors and styles is a fun way to reuse the same costume while keeping things fresh and unique. 4. In some cases, you may have pants that are too short because you have outgrown them. No need to fret. By wearing boots or some other longer piece of footwear you can tuck the pants into them giving the illusion that your costume idea was deliberate and no one will ever be the wiser. 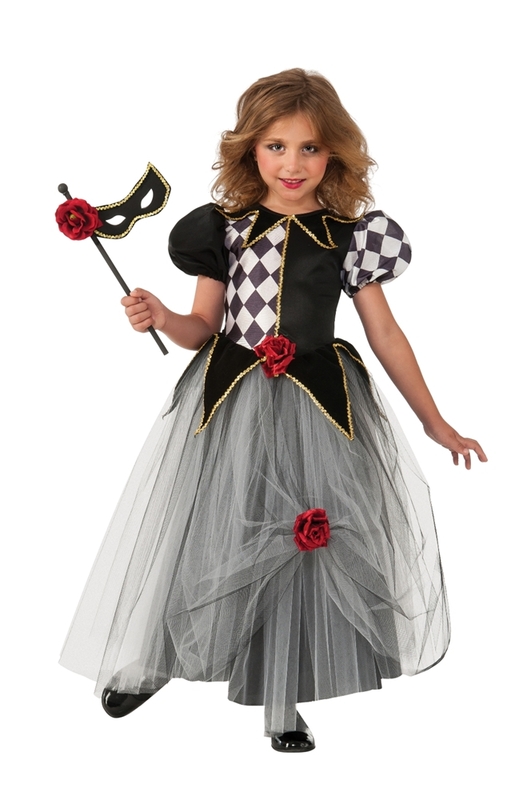 The design of this Dark Mad Hatter Child Costume is supposed to have pants that are shorter than usual, but the idea is that if you are wearing pants that are a little short like these you can mix and match different types of boots or even hi-top tennis shoes to cover up your ankles. A good rule of thumb when putting boot covers on is that you should always slip the boot covers on before you put your shoes on. 1. First and foremost, you should always wear socks and protective footwear underneath your boot covers--no sandals, unless the costume you're wearing comes with sandals; in which case, properly affix them to your feet after you have placed the boot covers on. 2. Apply the boot covers as though you are putting on a pair of socks. 3. Once the boot covers are placed to the proper height of your leg you can then put your shoes on over your feet but under your shoe covers. The Buccaneer Pirate Adult Womens Boot Covers can be put on with ease if you follow the steps given here. 1. All of the closure points on your costume need to be shut tight so that the air doesn't escape. 2. 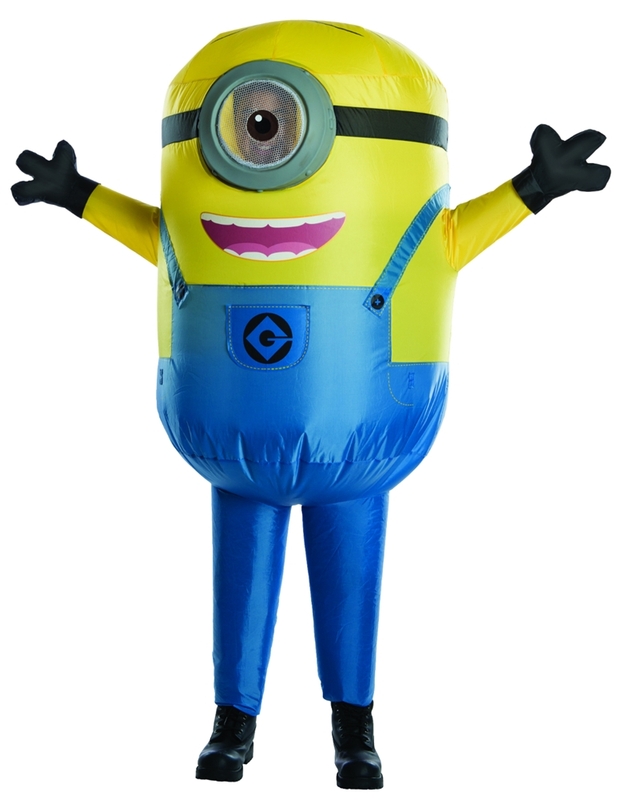 Make sure that the fan is running and that your inflatable costume is running on fresh batteries. 3. If ever you notice that there are openings in your costume, velcro strips are a good way of prolonging the life of your inflatable costume. Because inflatable costumes aren't made from traditional, porous fabrics velcro strips stick to them pretty well. Applying velcro strips to areas that are releasing air will help keep you inflated. Whatever you do, DO NOT PUT YOUR COSTUME IN THE DRYER! The heat along with the rumble and tumble of the dryer can ruin costumes; especially costumes that contain glitter. 1. If you have access to a garment steamer they work wonders in drawing out wrinkles. For those of us that don't, options 2 and 3 are effective and inexpensive. 2. Hanging your costume up in the bathroom while you're taking a shower allows the steam to smooth out your costume's wrinkles. 3. You can also turn your costume inside out, press a damp cloth to it and iron it on a low heat. 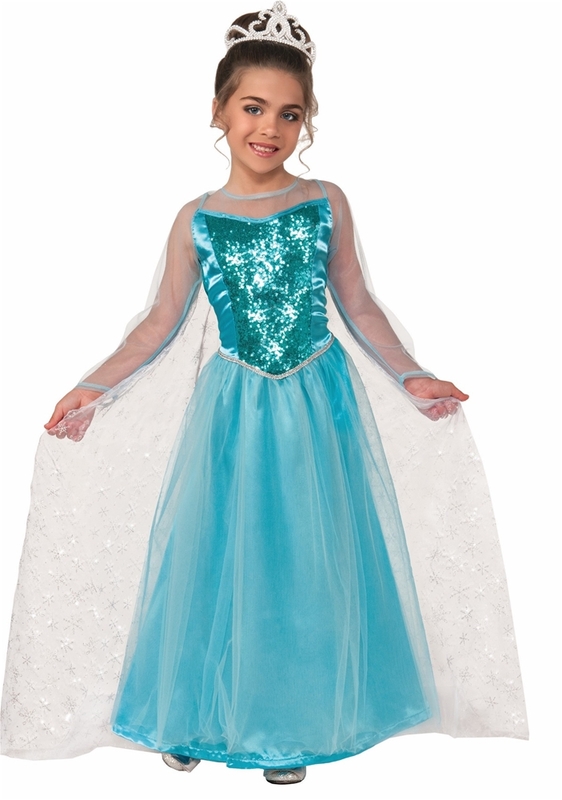 The Snow Queen Princess Krystal Toddler & Child Costume is a good example of a costume that contains glittery details and some delicate fabric. This type of costume should never be placed in the dryer in order to remove any wrinkles. Following the above tips can help smooth out unsightly wrinkles. Halloween costume care is something any costume collector can benefit from by following this list of helpful tips. Given proper care, our Halloween costumes can maintain their spooky appeal throughout the years to come. Think we missed something, let us know. Tips for masks can be found here. Now that you've learned about some of the ways we can preserve our costumes you're probably wondering how you can get your costume collection started or perhaps thinking about adding to an existing collection. 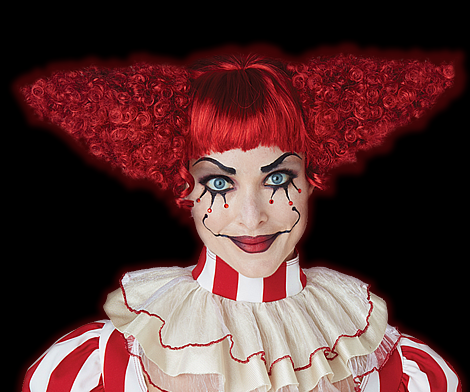 Peruse our collection of Halloween costumes by what's trending.